One thing we love about travel is the people that we meet. 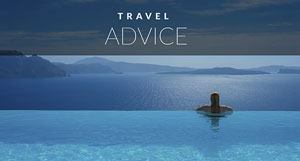 Locals and fellow travelers alike are what makes travel so interesting and exciting. It was while sitting in a campsite near Nice, France that we met Kelleigh and Andy who told us about a great campsite in Haute Provence that just so happened to be the entrance to a Via Ferrata. 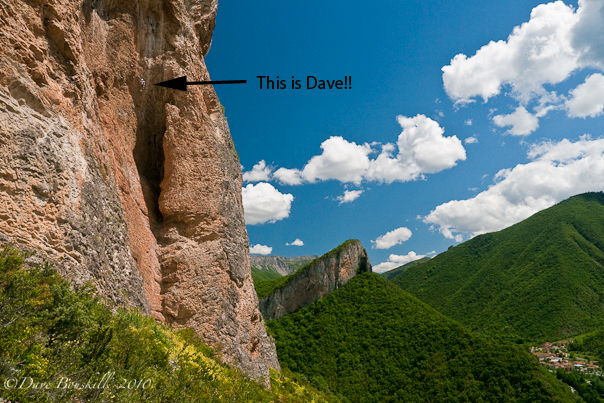 What is a Via Ferrata you ask? 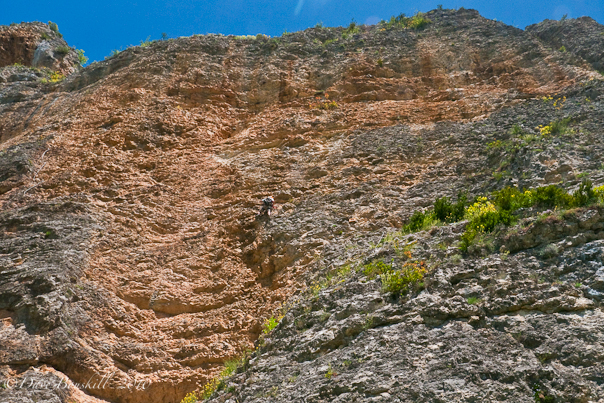 A Via Ferrata is one of those walks that you have seen so many times on photos on the internet. The photos where people call this hike the most dangerous hike in the world or the craziest trail in the world. We always wondered what these people were thinking of walking along cliffs until we realized that they were simply doing a Via Ferrata. A Via Ferrata is a lot like rock climbing but you don't have to have any technical skill or training. If you know how to attach a carabiner to a steel cable and climb a ladder you can do a Via Ferrata. Originally used to military squads in WWI across mountains, Via Ferratas are now used by hikers and climbers to connect routes and go up scrambles with relative safety and security. But I think that it is used today more by people to go out and have a thrill dangling off the side of a cliff for a day while getting the instant satisfactions of tackling a route. 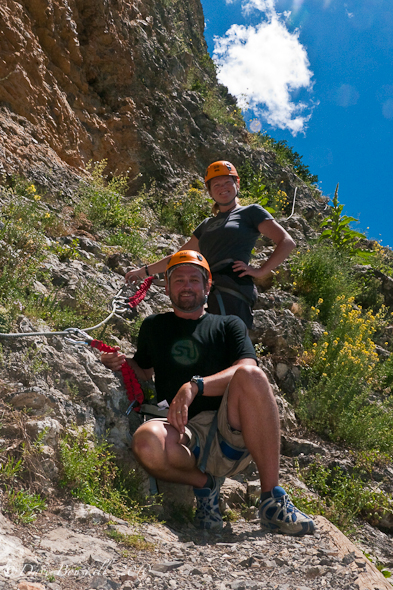 If you have never tried rock climbing before we strongly suggest hiring a guide. Via Ferratas are safe, but they are extremely high and if you are not used to dangling off of a cliff you may want to have a professional around. Dave and I used to rock climb a lot so all we had to do was go to the front desk at our campsite and rent the equipment. Our Campsite had everything that we needed to tackle a via ferrata and it had signs leading us directly from our campsite to the entrance of the trail. 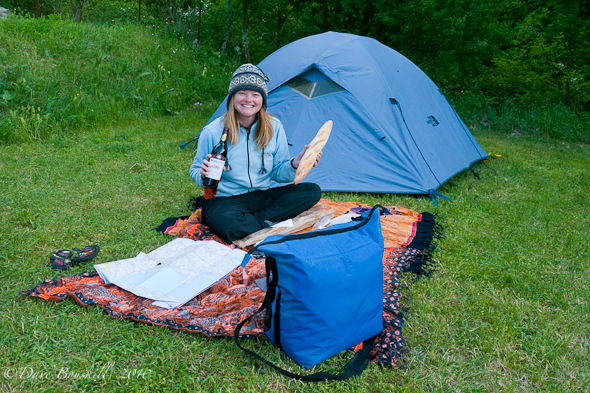 Camping near the Via Ferrata. Located in Digne Les Bains in Haute Provence France, Camp du Bourg is a friendly and quiet place to stay. It may not have the swimming pools and hot tubs of other places that we stayed at it in France but it was exactly what we were looking for. The sites were grassy and comfortable for picnics, it had a bar-b-que area and it even had tennis courts. From the looks of it, Camp Du Bourg is the main place in town for people to practice and play. For 3€ you can get yourself a wifi hookup for 24 hours as well. 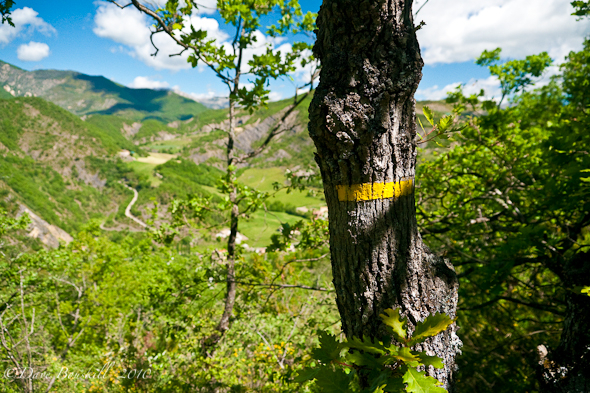 Follow the yellow Blazes to the Via Ferrata! We rented our harnesses and helmets for 12 € and listened to the friendly owner and his wife explain how to find the Via Ferrata trail. The trail is free so we had an adrenaline filled adventure for a meer 24 €! There is a sign pointing in the direction at the campsite but it is an hour trek up and over a mountain to get to the start. We found our way easily by following the yellow markers and eventually made it to the start of our first Via Ferrata. We didn't realize that we would be starting so high up already. We were already halfway up a mountain in the Alps and now we faced a sheer rock face going higher up to a cave and a Nepali bridge. You are clipped in at all times. What else could we do? We had walked all this way and had rented all this gear we had to just hold our breath and climb. Once we started it was incredibly easy and we felt perfectly safe. A steel cable lines the entire way as you walk along ladders, ledges and wires. Stay clipped in at all times!! The harness is supplied with 3 clips. Two are clipped in at all times, when you come to an obstacle in the route, you unclip each carabiner one at at time. You make sure to unhook one and hook it onto the next cable before unhooking the other and hooking it onto the next cable. It is a very simple system. 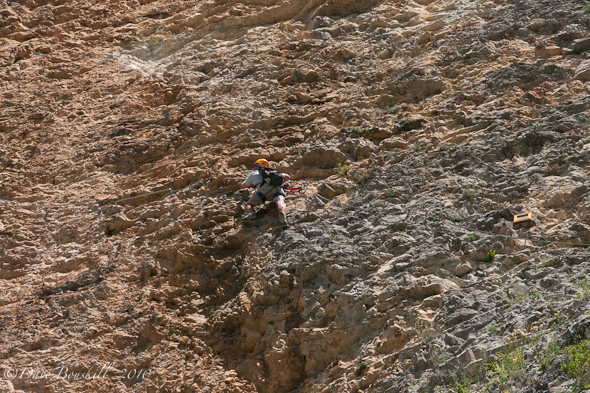 You are never at a point where you aren't secured to the rockface. The third hook is for relaxing and sitting back. But you always make sure to have the other 2 connected to the cables at all times. This cannot be stressed enough. The bridges were terrifying but luckily we had just finished trekking in Nepal and were used to walking over gorges. We weren't prepared to take photos of each other from that high up however and never managed to take that crazy photo that you see of people walking along planks and wires high in the air. We were too worried about taking the camera out and dropping it at that height. We are determined to find another Via Ferrata in our travels and get that shot, but for now we are happy to be able to try one. Give it a try! You will love it! 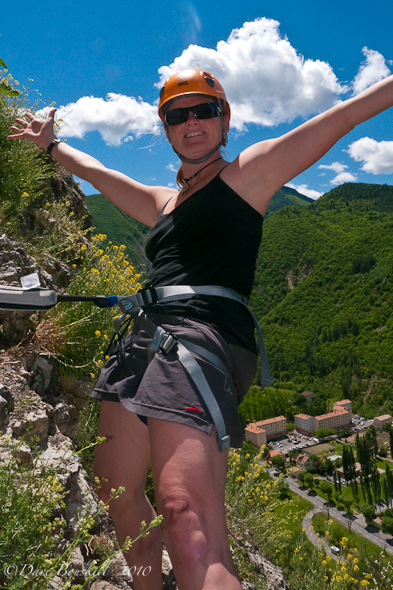 A Via Ferrata is excellent fun and if you have ever had the urge to climb like Dean Potter but want to be sure to be able to live to tell about it a Via Ferrata is definitely for you. Climbing in Hampi? Who Knew? 14 Responses to "Tackling A Via Ferrata in Haute Provence"
Via Ferrata provide some of the most amazing experiences! We have done a few in the Italian alps, but not in France. 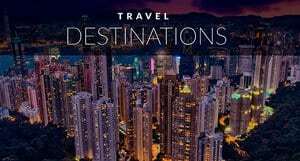 Yet another reason to travel! 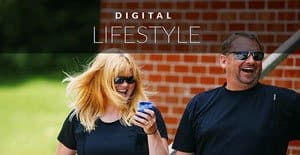 🙂 Great photos too — so inspiring! Hi Jennifer, you are right. We had never done them before France, but we would love to travel Europe and do them all now. It’s fun! 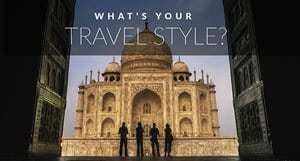 So right, always another great reason right around the corner as to why travel is awesome! OMG! Well since I’m absolutely petrified of heights I will content myself with just being super-impressed with you guys for doing this….the pictures make it look much more dangerous that you say it is, so I’ll take your word for it. Thanks Trisha. Our climbing friends certainly wouldn’t be impressed. A few years ago, we used to be very avid climbers. We ended up cycling Africa and couldn’t keep up with the climbing, (a person can only have so many hobbies) but this is a close second to experience the thrill of climbing. Thanks Mary Louise! You will be happy with the photostory on Friday, we went out in search for photos just for you! 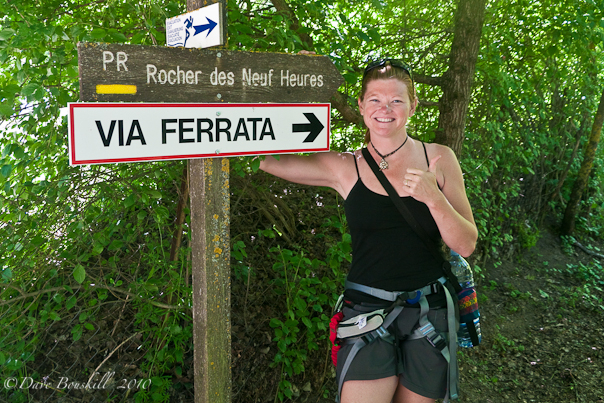 I’m off for my first taste of via ferrata next week – and I’m not sure whether to be inspired or scared stiff reading this post! .-= Abi from Inside the Travel Lab´s last blog ..She has not abandoned me… =-. Oh No NO Abi, you are going to have a blast. Do you have a guide? They are very high, but also very safe. Let us know how it goes! OK, so it’s over a year later and I don’t want to seem spammy, but here’s the link!! Hi Abi! Awesome, I just went over to your site to have a look. Great photographs! I couldn’t leave a comment for some reason. It’s like the comments wouldn’t load (there wasn’t a place to leave comments) But i saw it and so glad that you had the chance to do it. I am going to do more for sure! Awesome! I did my first via ferrata in Sabah on Mt Kinabalu and I’m eager for more around the world. .-= Dustin Main – Skinny Backpacker´s last blog ..Photo of the Day – Bat Exodus =-.